The Maldives was long a sultanate, first under Dutch and then under British protection. It became a republic in 1968, three years after independence. Since 1978, President Maumoon Abdul GAYOOM - currently in his sixth term in office - has dominated the islands' political scene. Following riots in the capital Male in August 2004, the president and his government pledged to embark upon democratic reforms, including a more representative political system and expanded political freedoms. Progress has been slow, however, and many promised reforms have been delayed indefinitely. Tourism and fishing are being developed on the archipelago. 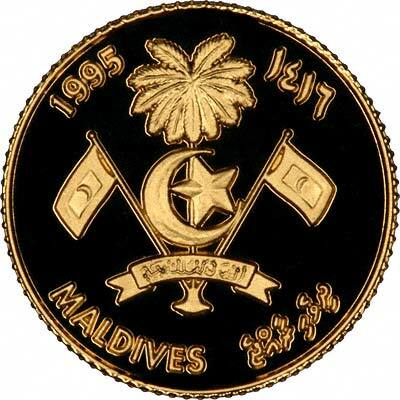 Although gold Mohur denominations were issued under the Sultans, the first recent modern issue of Maldives gold coins was in 1978. These are all commemoratives. Our photographs show a 50 rufiyaa (rupees) dated 1995. 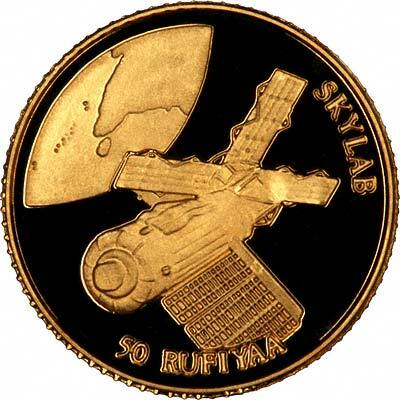 It was issued and marketed as "One of the World's Smallest Gold Coins", or similar! The coat of arms of the Maldives. For silver and base metal coins of Maldives, please look at our original Chard Coins website. We make an active market in almost all world coins, gold or otherwise, including Maldives gold coins. If you have any of these coins to sell, please contact us, or post them to us for appraisal and offer.